5. Derived surface wind data from Quikscat and Windsat satellites estimating winds over a 12.5 or 25km squares and rounded to the nearest 5 knots. The most accurate source of surface marine weather data are instrumented weather buoys. From my research there were no such buoys near the coordinates and time in question so to establish as best as possible the prevailing conditions other sources, such as ship weather reports, must also be considered along with any pertinent computer model data. Ship observations are usually taken by experienced seaman with wind speed and direction either measured directly with allowances made for ship motion or by estimating those conditions by viewing the sea state. Wave observations by ships are, for the most part, estimated. Ship observations are, however, actual observations and as such are an essential source of information to be considered along with other data sources. Since, in this particular case there were no buoys reporting wind or sea conditions then the only available actual observations were the ship based observations. The model data outputs used in the report are highly dependent on the accuracy of the initial conditions and the grid spacing used when running the model. The initial conditions will include all available weather observations and perhaps satellite data. The initial data inputs were not available in this report so I cannot tell how many, if any, ship observations were used in formulating the initial conditions. The conclusions in the report regarding the prevailing wind and wave conditions were based on calculations made by various atmospheric and wave model algorithms. As stated in the report “These are not direct measurements. They are extracted from charts based on the analysis fields generated by the numerical model”. Since the model grid points can vary from 12.5 KM up to 50KM they sometimes miss smaller atmospheric features so any actual marine weather observations must be considered as well as model data when making such an analysis. 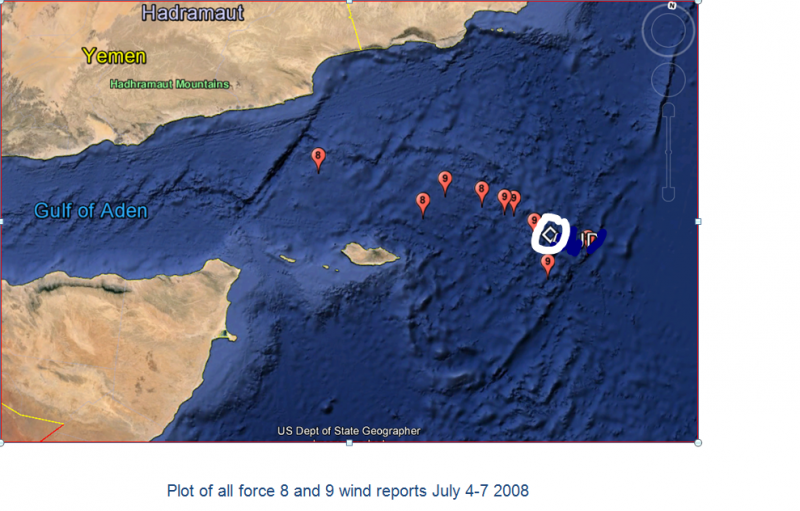 The listing of actual ship observations obtained from NOAA NCDC included 4 observations of Beaufort force 8 wind conditions and 6 observations of ships reporting Beaufort force 9 wind conditions in the general vicinity of the vessel during this time period 4 July to 7 July 2008 with significant wave heights reported of between 4 and 6 meters. The full spectrum of wave heights and wave periods in the open sea can be extremely complex with a mix of individual waves interfering with each other so that you can get wave peaks one on top of another adding to a combined higher wave height as well as wave peaks being canceled by wave troughs and reducing the combined height. The significant wave height is defined as the average height of the highest one-third waves in a wave spectrum and this happens to correlate very well with the wave height a skilled mariner perceives in a wave spectrum. Since the significant wave height represents the average of the 1/3 highest waves then some waves will be higher than the reported significant wave height. Based on past statistical studies, a significant wave height of 6 meters means that on average, about 10 waves out of 100 within this wave spectrum will reach a height about 7-8 meters and 1 out of 100 waves will reach a height of about 10 meters. Based on the above, it is my opinion that the vessel likely did encounter winds up to Beaufort force 9 and likely encountered some waves in the range of 7 to 10 meters. There is also the possibility that wind speeds would have exceeded this level in stronger gusts. In general, over open ocean waters, gusts can exceed the average wind speeds by 20-25 percent. We note that ship anemometers tend to be mounted higher than the standard 10 meter wind observation height of land-based weather stations and could lead to some over reporting of the wind speed, however, the difference in heights of various ship anemometers only creates a relatively small effect. Another consideration with the use of anemometers is that some inexperienced observers might record the apparent wind speed and direction without subtracting out the ship motion so that ships moving into the wind will report higher winds while those moving with the wind will report lower speeds. This is a function of experience and training. The superstructure of ships, like buildings, can also interfere with the wind flow so the placement of the anemometer is important. Anemometers located above the bridge of tankers/bulk carriers for example have been shown to have the wind accelerated by up to 10 % or decelerated by as much as 100%. It is more likely than not that this results in under recording, not over recording wind speed. July is a well-known for heavy weather in this area of the Arabian Sea. Various sources offer the risk for gale force (BF8) or higher winds from 16 % to about 30% depending on how small or large an area is considered. The Atlas of Pilot Charts shows for July that the this area experiences winds from the southwest 83% of the time with the most frequent wind observation at BF 7. The Pilot Chart also shows that there is a 50-60% occurrence of waves12 feet or more in that area during July.